Onions and shallots are essential vegetables. Most have yellow, white or brown skin and white flesh, but red-skinned and red-flesh cultivars make interesting alternatives. Shallots generally produce smaller bulbs than onions, with a more distinct flavour. They are used for pickling as well as cooking.They are both relatively undemanding crops giving good yields. Choose an open, sunny site and well-drained soil. High humidity around the foliage and wet soils make the crop more prone to disease attack. Onions do not thrive on acid soils (below pH 6.5). Reduce acidity by applying lime in autumn and winter. Onions have a limited root system therefore improving the soil with plentiful organic matter is invaluable. Apply two bucketfuls of well-rotted manure or other organic matter such as garden compost every square metre (yard). This will help add nutrients, improve the soil structure and hold moisture. Avoid using fresh manure. Little fertiliser is required at planting, apply 35g per sq m (1oz per sq yd) of Growmore or twice as much organic fertiliser such as dried poultry manure pellets. If you cannot apply organic matter – use more fertiliser, up to twice as much if the soil is poor. To ensure a good crop, the plant has to be strongly growing by late spring as the lengthening days trigger the formation of bulbs – the more leaf at this time, the better the bulb. Sow onion seeds in modules in mid- to late winter and keep in the greenhouse at 10-16°C (50-60°F). Sow shallot seeds in late winter. Harden off before planting out in spring. Although one plant per module is effective, growing three to four plants per module saves space. Sow five to six seeds per module and thin out if necessary to three or four plants. When multi-seeded modules are planted out, the onions form a clump of bulbs. 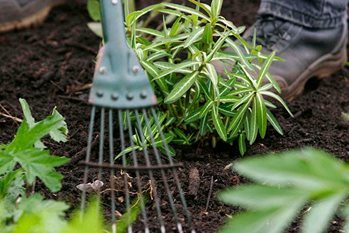 Once the soil is dryer and beginning to warm up, start sowing directly. Sow onion seeds from late winter until mid-spring 1.3cm (½in) deep in rows 20cm (8in) apart. Thin out first to 5cm (2in) and later to 10cm (4in). Closer planting will result in more bulbs and a heavier crop, but smaller bulbs. Sow shallots a little bit later from early- to mid-spring. Unlike shallot sets, seed-grown plants will only produce a single bulb. Thin out as required to 2.5-7.5cm (1-3in) apart. Growing onions from sets is generally easier and the crop will mature earlier. As onion sets grow they form a larger bulb. Shallot sets split, forming a clump of bulbs. As the foliage casts little shade the crop can be easily swamped by weeds, which would negatively affect the plants’ growth and subsequent yields. Hand weed regularly. Hoeing can be tricky as the foliage and top of the bulb can be easily damaged. Alternatively, consider planting through black plastic sheeting to suppress weeds. Water every 14 days during prolonged spells of dry weather until mid-summer. Watering of spring-planted or spring-sown crops after mid-summer can reduce the storage quality. Try to avoid overhead irrigation that encourages fungal diseases. Over-wintered onions and shallots greatly benefit from an application of 35g per sq m (1oz per sq yd) of nitrogen-rich fertiliser such as sulphate of ammonia in late winter. This not only enhances growth but can also suppress premature flowering. Alternatively, use dry poultry manure. Yellowing and toppling of the foliage is a sign that the crop is getting ready for harvest, but lift the bulbs before the foliage dies down completely. Flowering (bolting) is triggered by exposure to low temperatures in spring. Remove the flower as it appears. Such bulbs will produce thick-neck bulbs that will not store and should be used soon after harvesting. Withering of the foliage in dry weather may be a sign of onion white rot. The base of the bulbs and roots develops white fluffy mould. Onions and shallots are very susceptible to onion downy mildew, when the leaves start turning yellow and die off from the tip downwards. In wet weather white mould develops on dead parts often turning darker colour later. If the foliage develops orange pustules the crop may be affected by rust leek rust. If the bulbs become soft and brown, giving a ‘cooked’ appearance they may be suffering from onion neck rot. Affected tissue becomes covered with dense grey mould, later turning dry and mummified. This is mostly a problem of stored bulbs. Good cultivation including avoiding application of high nitrogen fertilisers late in the season can reduce occurrence of onion neck rot. Store only well-ripened bulbs. Ensure that they are not exposed to damp conditions in storage. Though the larvae of allium leaf-mining fly and leek moth can cause damage to the foliage of onions, they are mostly troublesome on leeks. Both leaf mining pests have two generations a year. They feed on the internal tissue of the leaves. The injury can lead to secondary rotting. Wilting of the foliage and collapse of young onion and shallot plant can be also caused by larvae (maggots) of the onion fly feeding on the internal tissue of the stems. Later the maggots destroy the inner tissue of the bulbs. Cultivate the soil thoroughly to expose the pupae that is overwintering in the soil. Cover young plants with a fine insect-proof mesh or fleece for the whole season to reduce infestation. Plants grown from sets are less susceptible to attack. The larvae of bean seed fly causes similar damage to germinating seeds and young plants.